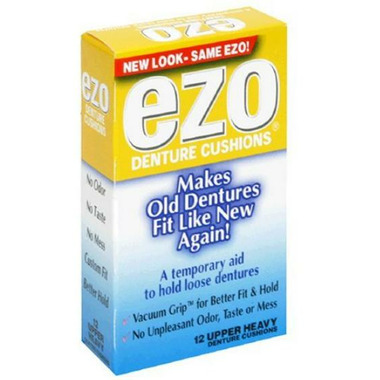 Ezo Dental Cushions are a temporary aid to hold loose dentures in place. This product just was not for me. I found them to be too thick and awkward. It could be that I am just too sensitive. Before using this product, my bridge was not stable in my mouth and was painful. After putting the EZO Dental Cushion, I solved both of these problems! It is comfortable and we dont feel the cushion. Ezo Dental Sushions are far superior to any I have used before. They are just a great cushion. Easy to use no mess ! I am very pleased with them. Thak you for stocking so many great products. I bought these for my 92 yr old mother in law after she told me she couldn't find them in the store anymore She was thrilled. She says they are the only thing that work to hold her dentures firm.